Second Guest Post by my amazing friend Meghan! She is an amazing writer and requested to write about the new single “Dead or Alive” by KAT-TUN! A new year has started and KAT-TUN has come out with a killer single. 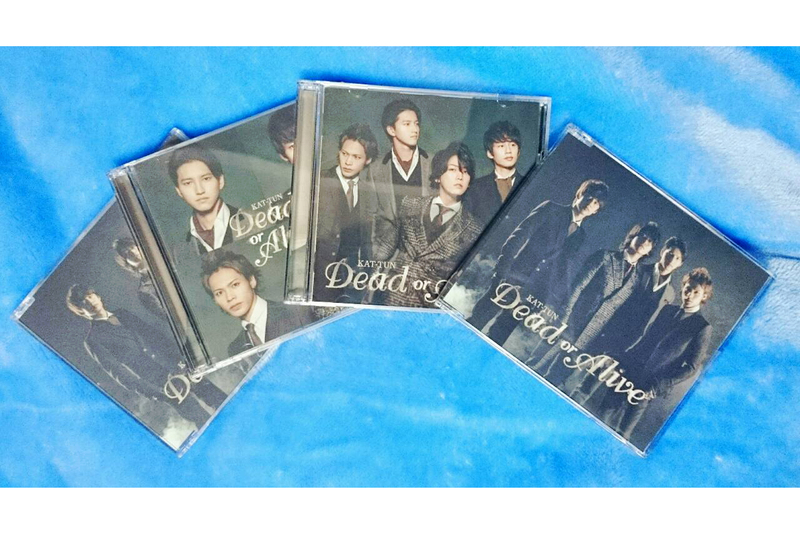 This January KAT-TUN released Dead or Alive. This song was written for Kame’s new movie, Joker Game, which was released on Jan 31st. Jovette and Maiko Rivera, the writers of Dead or Alive, have done a fantastic job with this song and has matched it well with the spy-love theme of the movie, while at the same time still holding true to the style he usually write s for KAT-TUN. Personally I was exhilarated to hear that he had written Dead or Alive and knew from the start that it would not disappoint. Proving my point, Dead or Alive made it onto the World’s Top 20 Single Awards at number 12, that’s above Maroon 5 and Ariana Grande. Dead or Alive sadly didn’t get much exposure on the usual programs. Due to the difficult situation at the moment in Islam with the Japanese hostages, KAT-TUN had decided that it would be best to perform their B-side tracks instead out of respect. The first A-side of this year has really outdone itself. The theme of this song was clearly ‘spy’ which I believe really opens itself to a variety of possibilities. Dead or Alive focuses on the secret lifestyle yet also showing that there is someone that they would protect no matter the circumstance. After seeing Joker Game, I understood that the song matched exactly to the movie and really brought out the emotions that Jiro Kato (Kame’s Character) had towards Lyn (Kyoko Fukada). The arrangement is fantastic; bringing a large range of instruments that is common in Jovette’s style and also reminds me No More Pain. Even with the large presence of string instruments, the guitar is what really catches my attention. The tune is catchy and also elegant; the transitions are smooth and flows throughout the whole song, including a quieter section in the middle of the song which ties it all nicely together without being repetitive at all. The lyrics continue the whole mysterious spy-love theme with phrases like “I will fly to save you” and “Searching for the meaning to live”. It possesses an almost lost and searching feel with an understanding that love is what you ultimately protect regardless of danger. Polaris is a big contrast to Dead or Alive. The music is light and sweet, a perfect little ballad. This to me I think is common to find on a KAT-TUN B-side. Normally we have a big A-side, very rocky and edgy, and then a sweet and loving ballad to balance it all out. Polaris is about the stars and love. I want to say it’s about lost love as it possess a melancholic tone but the sweet idea of promises of tomorrow that ends this song makes me think otherwise. Therefore, I would describe this song more as hopeful. White Lovers, which was sang on TV a few times, is another sweet song in my opinion, almost with the same feeling as Polaris. However White Lovers seems to be more about young lovers. The song is sweet and all about learning about one another. It’s a sweet song with a good beat that’s got a lovely piano playing in it throughout. I would describe this song as very Junno-like, not only because of his large amount of singing parts in it, but rather because the song reminds me of some of his solo songs. It’s sweet and cute and the blending of all of KAT-TUN’s voices go very well. Whereas Polaris was more hopeful, this song seems more promising and about enjoying the relationship. You are delicious is more a dance song. It’s energetic and upbeat with a good hook and smooth transitions. The most interesting part of this song is the lyrics I believe. The lyrics speak a lot about enjoying the night until morning using the analogy of roulette to explain that anything can happen. To anyone who is familiar with the club scene, the song seems to talk about the thrill of the club and about meeting with people and spending a fantastic night with them. As usual, KAT-TUN is dancing on the line with this song, not right out making explicit, but there are enough edgy phrases that make it rather suggestive. Overall, it’s a great song to bounce along to. To anyone who was following the series of solo songs and the solo music videos that KAT-TUN had recently been doing, you would understand what I meant when I say that Hanasanaideai was nearly a disappointment. This was one of Kame’s first solos and was often performed on Dream Boys. I understand that Kame would want to give live (both on CD and visually) to this solo. This song is very Kame-like. He portrays it confidently and beautifully, bringing across the insecurity a woman can feel in love. It dances on the edge of desperate and hopeful. Yet still echoes nicely with the music and matches well with the type of songs that Kame usually chooses for his solos. The music video is intriguing. A lot of loneliness is portrayed in it but also bringing through a lot of hope. The part that I was most interested in was how it seems that Kame has hit the bottom and yet refuses the assistance of a stranger (aka. Junno). Where the song talks a lot about hoping to be never let go, this just seemed a little contrasting to me. Half the video also features Kame dancing. Half of me suspects that this is an echo of his new drama starting February 6th (Second Love). Although I love the song, I found the music video a little bit of a disappointment. It’s beautifully shot and does fantastic work with the lighting. Don’t get me wrong, I love the spy theme and how KAT-TUN are all running around espionage style and singing. But part of me wanted more. I desired dancing that we usually get in their other videos, and if no dancing, at least a loose story line. The making of the video is a lot quieter and toned down than usual, but still has a few entertaining parts that made me laugh. As some of you know, this single featured a special edition which you had to order especially online. The title track is the same, and the design is the same as the Regular edition (a little disappointing, I was hoping for at least a different cover photo) but the contents were worth it. Overall I think that the single was very well put together and featured some good songs. I’m glad that Jovette and Maiko wrote the A-side this time and that I hope that he will be writing more of their singles in the future. If you haven’t heard the songs already, you should definitely check it out. Here’s another one of my articles written for nihonchique, please check it out.